"They made a charming picture - the American girl at the piano and her younger brother at her side. It would have been nit-picking to notice that the sheet music was written on the back of a Eurail napkin, and that the girl played falteringly." My favorite book in The 39 Clues series is Book 2: One False Note . I'm a classical music lover so this book appeals to my musical side. After the death of their grandmother, two orphans Amy and Dan, continue their hunt for 39 clues and race around the world, trying to beat other branches of the Cahill family in the search for the clues that will unlock a powerful family secret. The clues in One False Note center around Mozart, his older sister Nannerl and his musical composition KV 617. Amy and Dan, along with their au pair, Nellie Gomez, travel to Vienna, Salzburg and Venice following clues related to Mozart. They tangle with one of their relatives, Jonah Wizard (a member of the Janus branch of the Cahill family) and end up in a Janus stronghold. In trying to obtain the clue, they also encounter several other evil family members and dangerous situations. The fast paced book, written by Gordon Korman, includes plenty of action and should appeal to both girls and boys. How convenient Mozart happened to have an older sister! The two sibling relationships (Mozart/Nannerl & Dan/Amy) pair together well in this book. Even though One False Note can stand alone, I would recommend first reading Book One: The 39 Clues: The Maze of Bones. 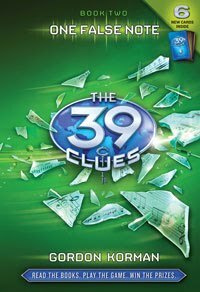 I love how The 39 Clues series highlights historical figures like Benjamin Franklin and Wolfgang Amadeus Mozart. To add further interest, Korman includes real tourist attractions like Mozarthaus and descriptions of Alpine scenery in his book. Readers may be compelled to learn more about the two neighboring countries Austria and Italy or read more about the famous composer Mozart. Like me, they might even listen to some of his music. Of course, after reading the book, I researched Mozart's KV 617. Even though the author chooses to have the characters in the book play the music first on a piano and then on a harpsichord, this chamber music was originally composed for glass armonica, an unusual instrument with which I was not previously familiar. Here's a YouTube video featuring the piece played on Glassharmonica. After viewing my blog stats regarding my previous 39 Clues post, I noticed a trend. Keyword searches indicate that many parents want a Christian review of The 39 Clues. One website that Christian parents might find helpful is Focus on the Family. The reviewers at Focus on the Family discuss the various subjects that some Christians might want to know more about such as profanity and Biblical references. They also provide discussion topics. Another resource is Common Sense Media. Because viewpoints range widely among Christians, I strongly urge parents that have concerns about this series to read book one for themselves (it is a short, easy read). I've read books 1-7 and book one provides an accurate measure for the series. The books do contain some violence and fighting, several explosions, scary environments like catacombs and some characters do die, but the events are far-fetched enough that children shouldn't find them overly troubling. This is an action/adventure mystery series (reminds me of the movie National Treasure), so suspenseful situations are to be expected. Out of curiosity, I also completed a few of the online missions on the interactive website. The website content parallels the books and doesn't contain anything I found too concerning as a parent. In fact, I found a few of the tasks relatively difficult even for an adult, like the magic square puzzle in one of the missions. Some kids may need to ask for assistance.